TGIF! It has been a seriously long week. I mean, you know you're in trouble when Tuesday feels like Friday. Anyway, I kept things pretty casual all this week, mostly because I've been having some trouble with my left ankle (old cheerleading injury) and was giving the heels a rest. I think it's important for people who want to work in this business to know that you can keep things casual without losing your professionalism. In fact, there will be days when a more casual outfit is better suited to what you're doing. 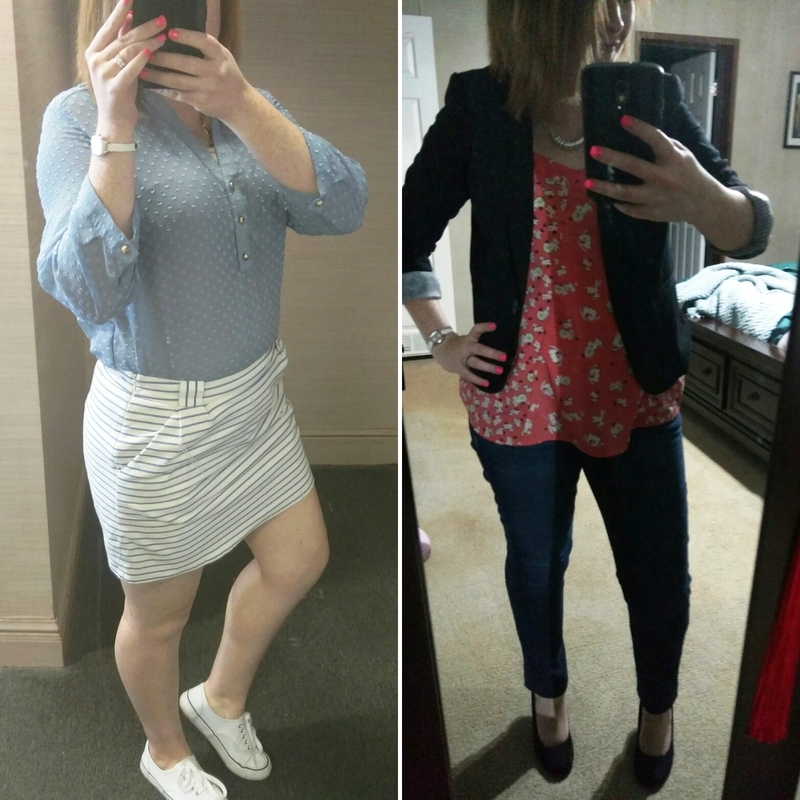 This is a pretty basic spring/summer outfit combo for me -- dark-wash jeans and a printed shell paired with a blazer and heels. It's simple and comfortable but still appropriate when representing the station. My shirt is a couple of years old as are my wedges. My jeans are new and rolled under to show a little more of my ankle. 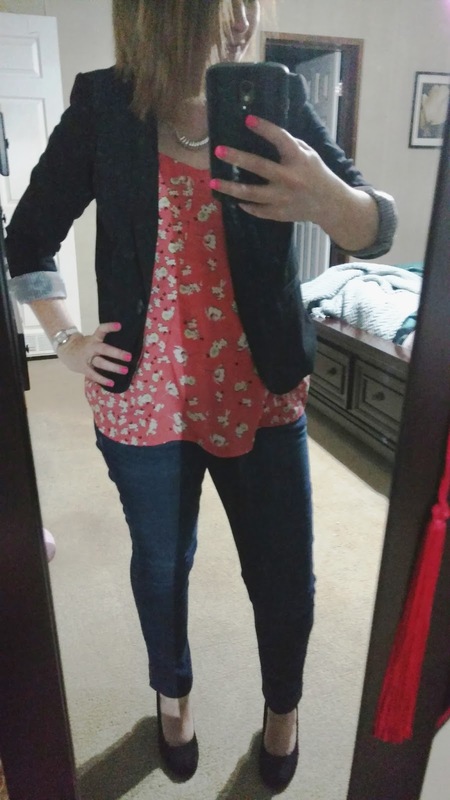 This is my favorite black blazer (I have three). It's the easiest to wear casually because of the cuffable sleeves. I love the small striping detail! You made me laugh when you wrote about your long week. I remember many Tuesdays during my career when I found myself wondering if the week was ever going to end. Sometimes I started complaining on Monday. :) I didn't look forward to the election cycle because, as you know, politics dominates the news for months on end, making it difficult to determine how many other stories to fit into the newscast. Many important and interesting stories were reduced from packages to vo/sot or were crowded out entirely by politics, and every commercial break was loaded with campaign spots. I couldn't wait for elections to be decided and things to return to "normal." I love today's outfits, especially the blue and white shirt and skirt combo with tennis shoes. The picture quality is superb. I don't know what the weather is like in southeast Alabama, but it is already getting uncomfortably warm here in West Central Florida. It will be interesting to see how you adapt your outfits to the heat, especially since you are now doing field reporting around your coverage area. Have a wonderful weekend, dear friend Ashton! Hi, Shady! We've been enjoying some spring-like temperatures over the past week with highs around the 80 degree mark. Humidity hasn't gotten unbearable just yet, but the pollen is ridiculous!